ORNL has suggested that 3D-printed magnets can outperform those created by traditional methods. 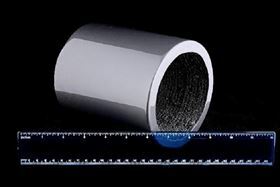 US-based Momentum Technologies has non-exclusively licensed Oak Ridge National Laboratory’s 3D-printed magnet technology and plans to commercialize the first 3D-printed magnet made from recycled materials for use in electric vehicles, wind turbines and high-speed rail. ORNL has suggested that 3D-printed magnets can outperform those created by traditional methods and could be used in electric vehicles, wind turbines and high-speed rail. Momentum holds two other ORNL technology licenses related to the recovery of rare earth minerals and magnets from electronic waste. ‘Bringing together these technologies through the Department of Energy’s Critical Materials Institute and ORNL allows us to create a sustainable domestic supply of low-cost magnets made from recycled materials recovered from hard disk drives,’ said Momentum’s CEO, Preston Bryant. This story is reprinted from material from ORNL, with editorial changes made by Materials Today. The views expressed in this article do not necessarily represent those of Elsevier. 3D printed magnets offer cheaper and environmentally friendly approach. Permanent magnets produced by additive manufacturing can outperform magnets made using traditional techniques while conserving critical materials. SmarTech Publishing has just announced the schedule for a new series of reports covering the 3D printing industry.